888 pages | 97 B/W Illus. Progressing from general scientific principles and concepts to in-depth topical discussions of current research and treatment methods, this comprehensive reference defines the cellular and molecular mechanisms contributing to inflammatory lung injury and repair. Extensive coverage is provided on key mediators and pathways important in acute and chronic pulmonary inflammation and lung injury, as well as the mechanistic pathophysiology of related diseases ranging from clinical acute lung injury (ALI) and the acute respiratory distress syndrome (ARDS) to idiopathic pulmonary fibrosis (IPF) and other subacute and chronic conditions. Additional chapters also address vascular dysfunction, surfactant dysfunction, reactive oxygen/nitrogen species, and cell and animal models of acute and chronic lung injury. 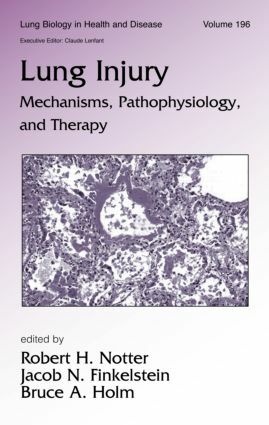 "…this book provides a current overview of acute and chronic lung injury….the book's extensive reference lists are a valuable resource for more in-depth information." "…this is a unique book written and edited by the top authorities in the field. It will have great interest among basic scientists." Introduction. Principles of Lung Development, Growth, and Repair. Acute Lung Injury: Etiologies and Basic Features. Cellular and Animal Models of Lung. Transgenic Models of Lung Injury and Repair. Inhalation Toxicology: Methods and Models. Inflammatory Cells and Mediators in Acute Lung Injury. Mechanisms of Chronic Lung Injury and Fibrosis. Roles of Oxidants and Antioxidants in Lung. Vascular Dysfunction in Lung Injury. Surfactant Dysfunction in Lung Injury. Ventilation Therapies and Strategies for Lung Injury. Anti-Inflammatory Therapies for Lung Injury. Surfactant-Based Therapies for Lung Injury.